MyDigitalSSD is now shipping one of the first USB enclosures for M.2 NVMe SSDs. The new M2X enclosure is based on the JMicron JMS583 USB 3.1 Gen 2 to PCIe 3.1 x2 bridge chip. This bridge translates the SSD's NVMe storage protocol into standard USB Mass Storage protocol or USB Attached SCSI Protocol (UASP), allowing for a portable SSD with much higher performance than the majority of portable SSDs that use SATA SSDs internally, while also offering much broader compatibility than Thunderbolt enclosures and portable SSDs like the Samsung X5. 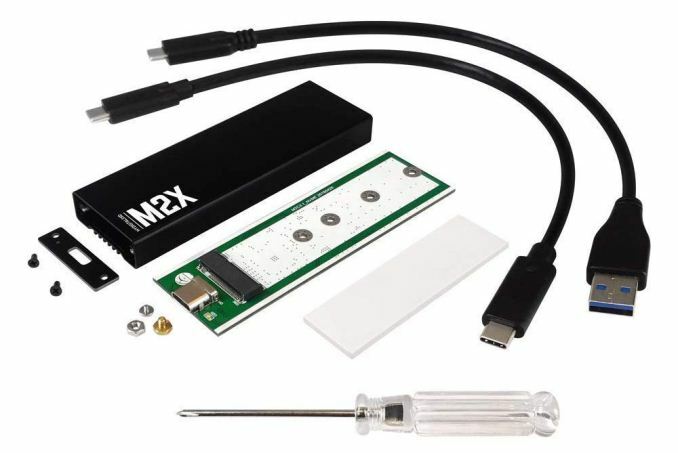 The MyDigitalSSD M2X is a DIY kit for assembling a portable SSD with the user's choice of M.2 NVMe SSD. (M.2 SATA drives and M.2 PCIe drives that use AHCI instead of NVMe are not supported, but there are already plenty of enclosures for the former.) The bottleneck for sequential transfers will be the 10Gbps USB 3.1 Gen 2 host interface, which allows for around 1GB/s throughput. The JMS583 bridge chip is backwards compatible with USB 2.0 and the M2X is supplied with USB Type-C and Type-A cables, so the M2X will be plug and play with basically everything out there. On the other side of the bridge chip is a PCIe 3 x2 link, so there's little reason to put a high-end NVMe SSD inside the M2X instead of a cheaper two-lane SSD such as the MyDigitalSSD SBX or the Kingston A1000, both based on the Phison E8 controller. There's no mention of NVMe Host Memory Buffer (HMB) support in the JMS583 documentation so DRAMless NVMe SSDs like the Toshiba RC100 used in the M2X will tend to have much worse random access performance than with a direct PCIe or Thunderbolt connection to the host, even before taking into account the NVMe to USB translation overhead. The MyDigitalSSD M2X is bus powered and includes a thermal pad to help conduct heat from the M.2 SSD to the aluminum case. There doesn't appear to be a similar pad for the JMS583 bridge chip, which is rated to consume 700mW under load so its 8mm package will likely be the hottest component inside the M2X. Since USB ports usually only deliver 4.5W total, this leaves about 3.8W for the SSD itself. Most NVMe SSDs stay well below this when limited to 1GB/s, but sustained sequential writes could push some drives beyond this and lead to trouble. It's not clear if the JMS583 supports putting NVMe drives into a lower-power active state so that they throttle themselves before drawing too much power. The MyDigitalSSD M2X is now available from Amazon for $39.99 or through MyDigitalDiscount for $36.14. The JMS583 bridge chip debuted at Computex earlier this year. At the same show, ASMedia introduced their competing ASM2363 USB 3.1 to PCIe 3 x2 bridge, but products based on the ASMedia bridge have not yet made it to market. Does anyone know of a USB adapter like this that has PCIe x4 support for higher end drives?